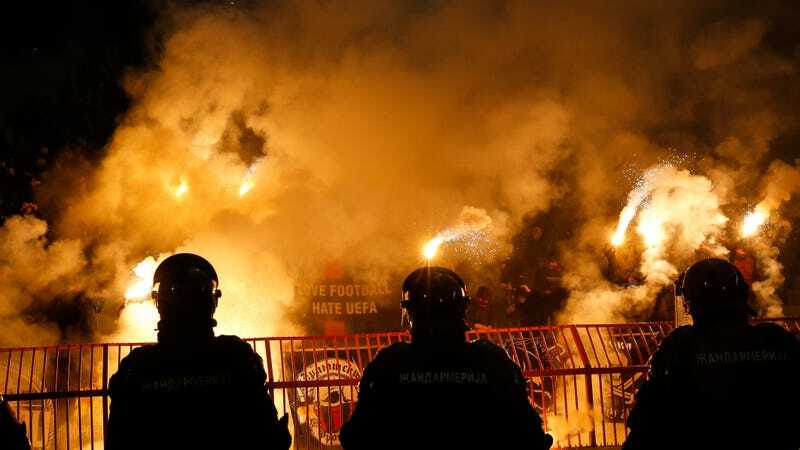 Traveling Russian fans delayed the second half of CSKA Moscow’s Europa League draw against Red Star Belgrade thanks to a terrifying flare offensive. The Moscow faithful set off a fiery blaze during the break and the pyrotechnics created a spectacularly hellish effect, with a wall of flames lining the barrier that separated the crowd from the pitch. Unsurprisingly—as evidenced by this photo that Getty Images promises me is from a soccer game and not, like, some secret Brooklyn club I am not cool enough to get into—the smoke from the flares drifted onto the field, to the point where TV viewers could barely tell what was happening. That caused a short stoppage in play while visibility returned. Amazingly, however, nobody appears to have been injured by the flares, and neither the firemen nor the riot police standing by intervened. By Russian soccer fan standards, that makes this inferno a rousing success.